Popular dance teacher Yolanda Vargas developed a passion for dance and has studied and won many top-level competitions in Latin and Ballroom. Yolanda has both trained and taught top professionals, as well as organized and hosted countless ballroom, West Coast Swing and Salsa events and dances. Yolanda teaches beginning, intermediate, and advanced classes and is now the proud owner of Infinity Dance Sport Center in Kearney Mesa and invites you to come see the facility and join the fun. Whether you are a beginner or advanced student there is something for you at Infinity Dance Sport Center. Yolanda is a Registrant with the National Dance Coucil of America, President of the Professional Dancers Federation, a Scrutineer, a Notary Public, Ballroom Dance Instructor for UCSD for the past 29 years, and a Certified Dance Instructor with the most respected and leading ballroom dance organization in the world; The Imperial Society of Teachers of Dancing. Call (858) 560-4372 to schedule lessons with Yolanda or take a tour of Infinity Dance Sport Center. Kurt has danced all his life, including classical ballet, jazz, modern dance, tap, ballroom, and latin dancing. He has also worked with actors and personal training. Kurt has been a 10-dance professional competitor in International Standard and Latin in Europe and the United States as well as a pro-am competitor in International Standard and Latin and American Rhythm and Smooth. He has had numerous performances and shows in the United States and abroad. Kurt received dance teacher education in Germany (ADTV certification, equal and beyond ISTD fellow). He has over 30 years experience teaching amateurs and professionals in International and American style. Kurt is also a championship-certified adjudicator for International Standard and Latin dancing with NDCA and Terpsichore. 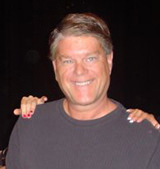 He has been a movement coach and professor for actors in the Masters degrees program of the Old Globe Theater and USD and teaches body awareness, isolation, character development, and stage application. Kurt periodically teaches group classes and workshops (check the studio schedule) and is available for private lessons. Call Infinity today at (858) 560-4372 to schedule lessons or join group classes with Kurt. Have fun learning to dance in a relaxed setting with an instructor who has studied music and dance for 20 years. With a background in ballroom, swing, and music theory, Yvette will share her love of movement and help you relate to music that keeps your toes tapping and your heart pumping. We all have stumbling blocks but she can help you take the dance from a concept to a form that works for you. Request special lessons to use Yvette as your private trainer to get the results you want! After all.it.s not about fitting you to the dance, it.s about fitting the dance to you! Call Infinity today at (858) 560-4372 to schedule lessons or join group classes with Yvette. Christian McCullen lives and works in beautiful San Diego, CA. Having spent most of his life in a social dance studio he is enthusiastic about sharing his insight acquired over the years. With the development of each dance came the desire to combine many different styles to create inspirational movements while still maintaining a social appeal. With over 16 years of teaching and dance experience, his innovative methods have become very adaptable and refined for every level of dancer. From the first time beginner to the seasoned performer each class offers a satisfying feeling, keeping you confident on the dance floor. Call Infinity at (858) 560-4372 to schedule lessons with Christian. Journey to samba began with her love of Brazilian music. A fine artist by profession, she instantly found a new passion in dance when she heard the rhythm of Batucada. She joined Super Sonic Samba School where she learned to play percussion and eventually transitioned to becoming a true Sambista. Dina trained rigorously with different instructors, began performing, and is ever expanding her knowledge of Brazilian culture. In 2013 she was given the privilege of becoming Rainha de Bateria (Queen of the Drums) of Super Sonic Samba School. In the same year she founded Energia Entertainment, specializing on live Brazilian shows featuring live music, dancers, deejay.s and live art, merging visual and performing genres. As a Director, Choreographer and Dancer, Dina is involved with many different projects and various dance companies. Her work is created in collaboration with other artists, and she expands her connections in the performers. community. She is constantly inspired by others, and strives to give her audiences the joy that she felt in her heart when she fell in love with Samba! Call Infinity today at (858) 560-4372 to schedule lessons with Dina. Marcus was born and raised in California. It was his destiny to dance; his parents are Patrick and Wendy Johnson, award winning dance team and world class judges. Ohio Star Ball Rising Star Latin Champion; 2x U.S. National Rising Star Latin Vice Champion; U.S. National Professional Open Latin Semi-Finalist; 3x Asian Open Top 24; Asian Open Semi-Finalist; U.S. National Professional Open American Rhythm Finalist; World Professional Open American Rhythm Finalist; 3rd Place World Rhythm Show-Dance. Call Infinity at (858) 560-4372 to schedule lessons with Marcus. Passion, excellence, and dedication are qualities that Selena has shown to be excelling factors in her determination and accomplishment in dance. Born in the southern United States, Selena discovered this passion for dance at an early age when she began to train in ballet and jazz. She continued to study dance throughout her adolescence leading her to Nashville, TN where she earned a degree from the Speech and Theatre Department at Middle Tennessee State University. Upon graduation, she began teaching, performing, and competing. Selena quickly developed her talent as a professional dancer. Her specialty and passion is for American Smooth Style Ballroom. This style combines the structure of traditional ballroom with the freedom to break away from dance position and incorporate elements of Latin, Jazz, and Broadway creating a more contemporary take on ballroom. As a competitor in this style she has quickly attained many titles. Some of the most recent include Indiana Challenge Champion, Heritage Classic Rising Star Champion, People.s Choice Champion, Virginia State Rising Star Champion, Southern States Rising Star Champion, First Coast Classic Rising Star Champion. In addition to competing, Selena has also developed a passion for teaching. She enjoys bringing dance into the lives of others so they too can experience all its joy and benefits. She is currently teaching both International and American styles of Latin and Ballroom. She teaches all levels from beginner to advanced and enjoys competing in Pro/Am divisions with her students. Call Infinity today at (858) 560-4372 to schedule lessons with Selena. Call Infinity today at (858) 560-4372 to schedule lessons.